7 Takeaways From Election 2018 The biggest story of the night is that Democrats took back the House. That will stop President Trump's agenda in its tracks unless he compromises with the other side. President Trump arrives at a campaign rally Monday in Fort Wayne, Ind. There are a lot of different ways to read the results from elections across the country Tuesday. 1. It was a Democratic wave in the House, and that is a very big deal. Supporters for Sharice Davids, a Democratic House candidate for Kansas, react as she is declared the winner during a watch party in Olathe, Kan., on Tuesday. Davids defeated incumbent Republican Rep. Kevin Yoder. This stands head and shoulders above anything else you'll read about the 2018 midterm elections — and maybe the only thing that matters. Come January, Democrats will be in charge of the House once again. They stand to pick up between 24 and 32 seats when all the races that are too close to call are finally decided. Democrats needed a net gain of 23 seats to take control of the House. Make no mistake: That is a wave. Just how big a deal is recapturing the House for Democrats? Imagine a scenario in which Republicans maintained control of the House. President Trump and Republicans would consider themselves validated and step on the gas, likely repealing the Affordable Care Act, rolling back more regulations and seeking any other number of policy priorities that Democrats would find odious. Now all of that is stopped in its tracks. For Democrats — feeling a degree of disappointment at losing some closely watched governors' races and suffering a net loss of at least a couple of seats in the Senate — taking back the House is a major victory. It's the equivalent of a court-ordered injunction keeping the steamroller at the property line. 2. A lot of centrist Democrats will be headed to Congress. That presents an opportunity and a challenge for Democrats. In order to secure that victory and retake control of the House, however, it took a lot of wins in center- to center-right congressional districts. That can be an opportunity for Democrats to own the middle after an election in which the president did little to win over independents. It's also a challenge in that a new Democratic speaker of the House — presumably Nancy Pelosi, who spoke for the party Tuesday night — will have to try to unify a caucus that will have new centrists as well as a restive progressive base looking to exact revenge on Trump as the 2020 presidential campaign begins to ramp up. 3. The power of Trump was clear in Senate races. 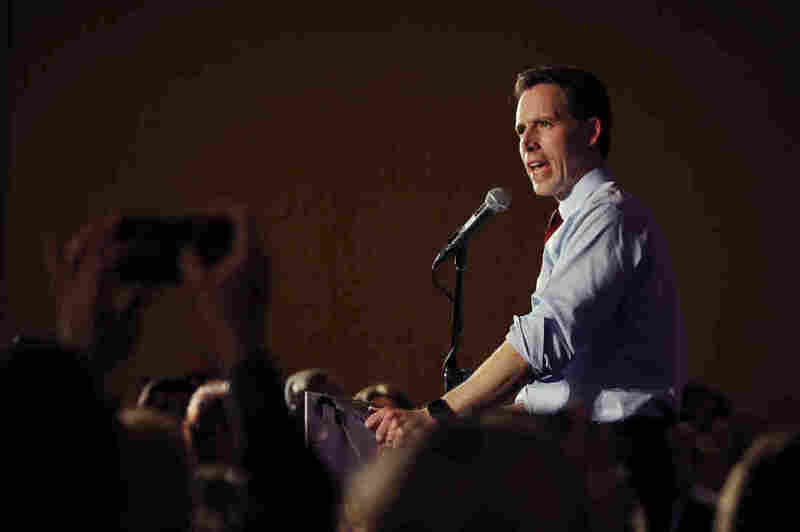 Senator-elect Josh Hawley gives his victory speech in Springfield, Mo., on Tuesday. He defeated Democratic incumbent Claire McCaskill. Despite the results in the House, there was a very different message in the Senate. Republicans stand to gain as many as four seats. Three seats have not yet been called, but Republicans lead in Montana, Arizona and Florida. Add those to Republican pickups in North Dakota, Missouri and Indiana and it was a virtual wipeout of the competitive seats held by Democrats. Trump lobbied hard in those states and appealed to his base. They turned out and again defied the polls. In practical policy terms, what will an expanded GOP Senate majority mean? Not very much, since the filibuster was already eliminated for federal judges and Supreme Court nominees. Look for Republicans to continue to confirm as many judges as possible and place another Supreme Court justice on the high court if a seat comes open. 4. Republicans who distanced themselves from Trump didn't fare so well. 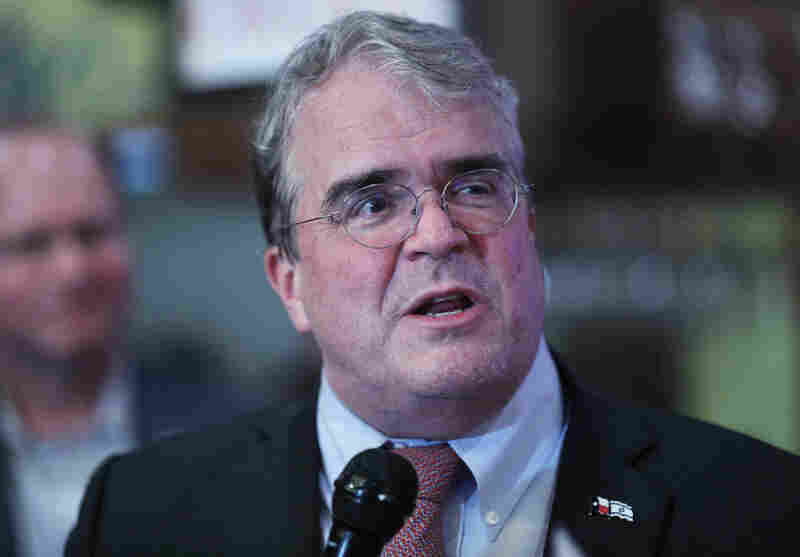 Rep. John Culberson, R-Texas, gives his concession speech at an election night party in Houston. Culberson came up short in his bid for re-election to represent the 7th District against Democratic challenger Lizzie Fletcher. 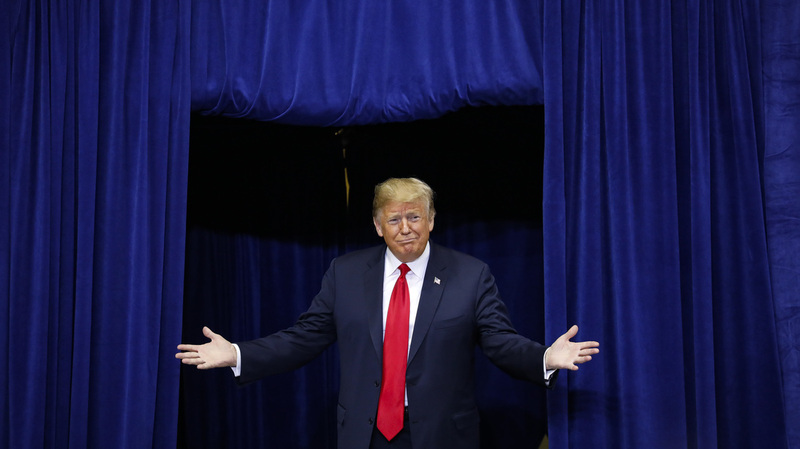 There was a real divergent message out of this election: Trump turned off independents, women and suburban voters key to the House races, but candidates who distanced themselves from Trump lost. Think about soon-to-be-ex-Reps. John Culberson of Texas, Kevin Yoder of Kansas, Carlos Curbelo of Florida, Mike Coffman of Colorado and Barbara Comstock of Virginia. They all tried to put space between themselves and Trump in one way or another, and they lost. But embracing Trump may not have helped those candidates in their districts either. They may very well have been caught in the Trump vise from the moment he was elected president. 5. Democrats made gains at the state level, but not as many as they would have liked. Tony Evers, Democratic candidate for governor of Wisconsin, speaks at a rally in Milwaukee. 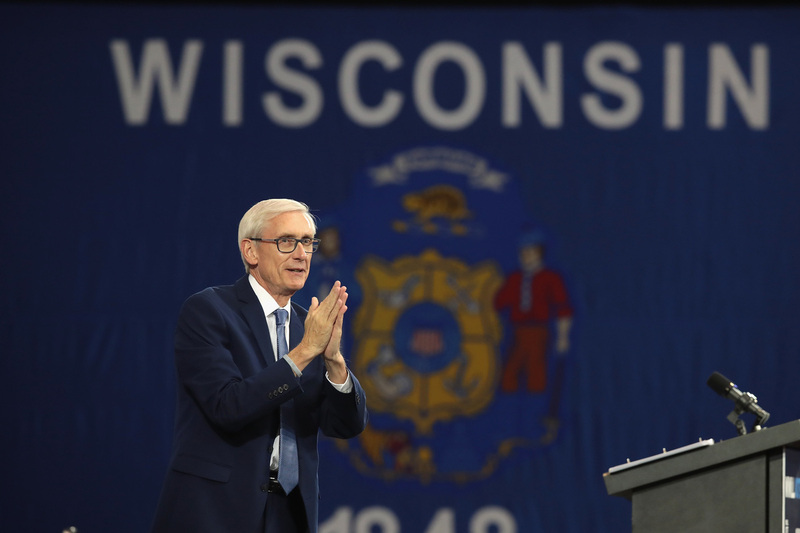 Evers defeated Republican Gov. Scott Walker. 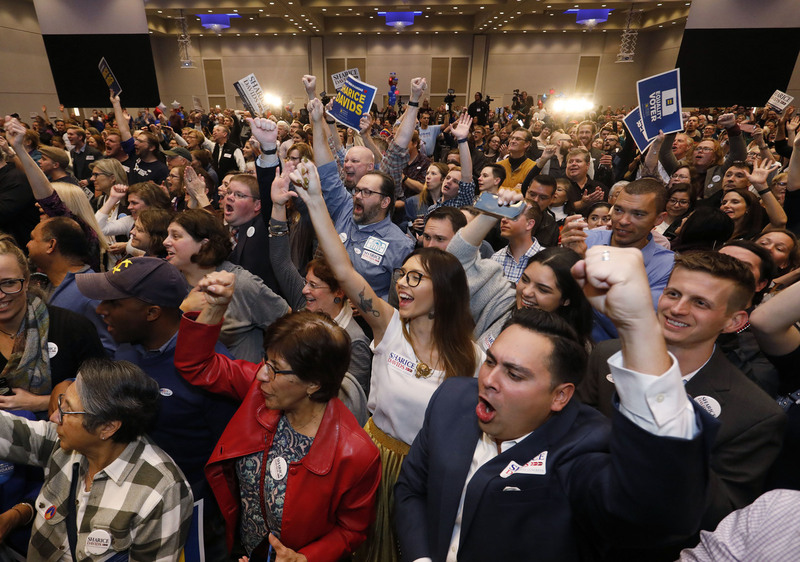 Some Democrats may feel a bit of a letdown after Tuesday night because they are projected to lose some of the marquee races that grabbed national attention, like the Florida governor's race, as well as the Senate race in Texas. And the governor's race in Georgia is also looking like a GOP victory but the race has not been projected yet and Democrat Stacey Abrams has not conceded. Andrew Gillum in Florida, Abrams in Georgia and Beto O'Rourke in Texas were among the favorites for the Democratic base, and they each came very close. Democrats also lost the governor's race in Ohio. But Democrats can feel good about finally defeating Scott Walker in Wisconsin after several bruising elections. And that means now in that critical trio of states that Trump won — Michigan, Wisconsin and Pennsylvania — Democrats now have the governorship in all three. That's something to think about ahead of 2020. 6. There will be a record number of women in the House. 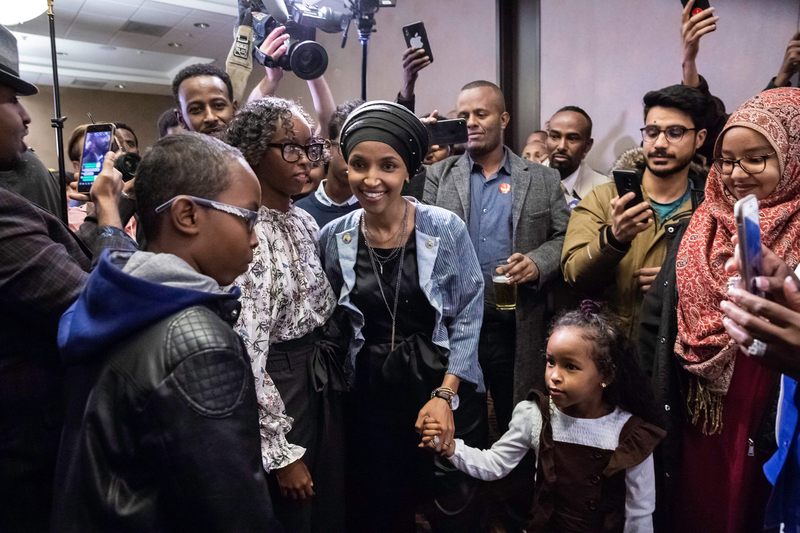 Democrat Ilhan Omar (center), newly elected to the House of Representatives, arrives for her victory party in Minneapolis on Tuesday. Voters elected two Muslim women, both Democrats, to Congress, marking a historic first. When all the votes are counted, more than 90 women will be members of the House. Women will still be far underrepresented in the halls of Congress come 2019, but their new level of representation surpasses the previous record of 84 women serving in the House. And the overwhelming majority of them — more than 80 — will be Democrats. It's the culmination of a year that saw a record number of female candidates, especially Democratic women, run and win races for federal office. 7. The polls were wrong — and right – again. The national polls pointed to a Democratic national majority, but several statewide polls were off from their final polling average results. Sound familiar? It was the same story in 2016, and it's becoming a pattern. There were dozens fewer good statewide polls in this cycle. Local newspapers used to pay for these polls. But with the decline of revenue at local newspapers, they either aren't funding polling or are going with cheaper, less rigorous outfits. It's a problem with no clear solution. It's also a reminder that while polls can be great to help with trends and getting a sense of what's important to the electorate, they aren't everything and can't tell you precisely who will show up to vote.